"When you need advanced joining and manipulation, that's when Alteryx becomes useful. Let the computer do the stuff it's good at. I want to do what I'm good at: being creative. 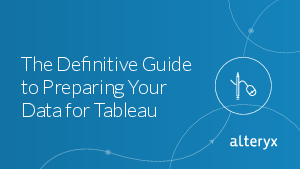 Enable the cycle of visual analytics with Tableau and Alteryx together." All your work is done in an intuitive drag and drop work flow that is re-useable, modifiable and outputs to a Tableau Data Extract – saving you time and letting you visualize your data faster.